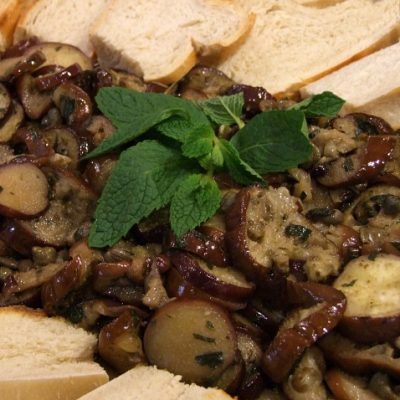 I love to bring this recipe to pot lucks because it is always a big hit! Slow roasted eggplant, peppers and onions turned into tender, caramelized morsels. 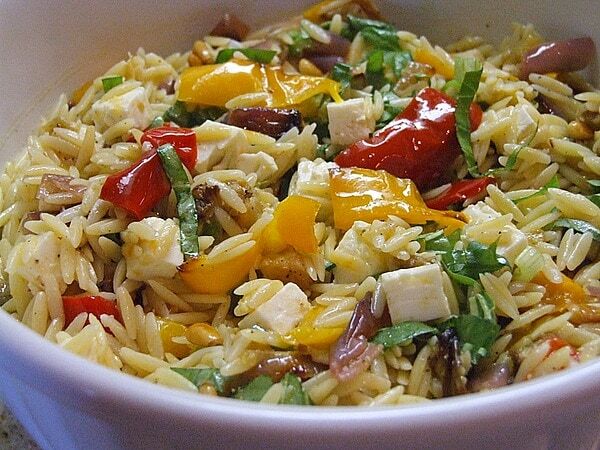 Veggies are added to cooked orzo and tossed with a lemony dressing. Add scallions, toasted pine nuts, fresh basil and CHUNKS of feta (not crumbled) and you’ve got yourself a side salad. It is typically served at room temperature, but it is just as good chilled the following day. LOVE! Try subbing out zucchini for eggplant and walnuts for the pine nuts, also very good. 2. 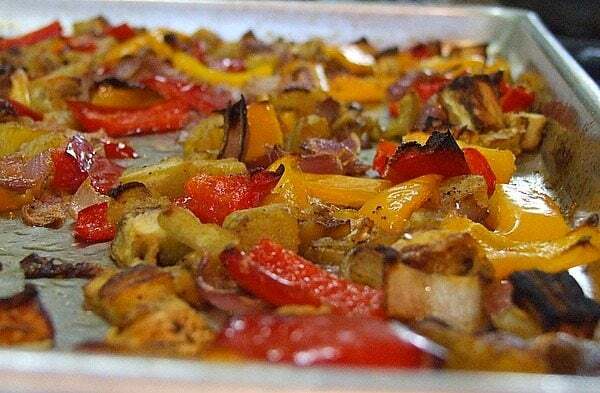 Toss eggplant, bell peppers, onion, and garlic with the olive oil, salt and pepper on a large baking sheet. Roast for 40 minutes, until browned, turning once with a spatula. 3. 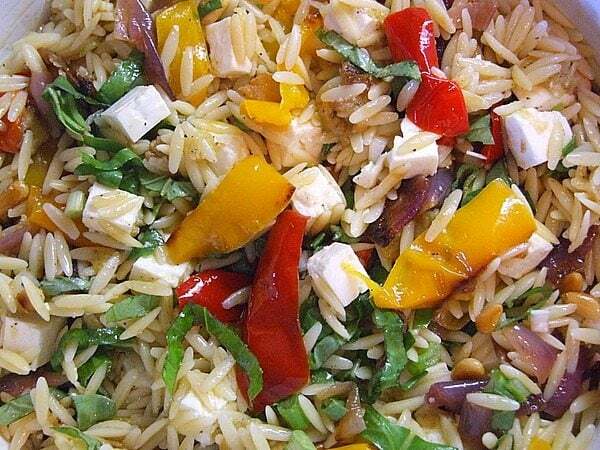 Meanwhile, cook the orzo in boiling salted water for 7 to 9 minutes, until tender. Drain and transfer to a large serving bowl. 4. Add the roasted vegetables to the pasta, scraping all the liquid and seasonings from the roasting pan into the pasta bowl. 5. For the dressing, combine the lemon juice, olive oil, salt and pepper and pour on the pasta and vegetables. Let cool to room temperature, then add the scallions, pine nuts, feta and basil. Check the seasonings and serve at room temperature. 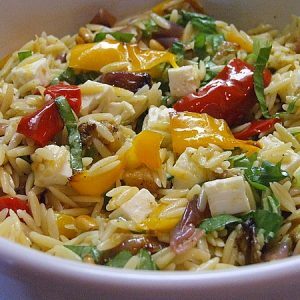 *Add the dressing when the orzo is still warm so it absorbs into the pasta. 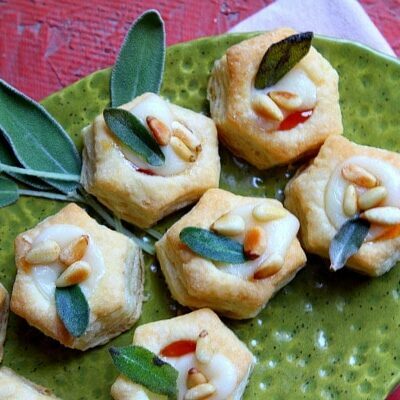 *This dish is even better made in advance; just check the seasonings and add the pine nuts, feta and basil leaves at the last minute. We don’t like Feta cheese ,can you suggest any other cheese? Also could I.put zucchini in it also? Could i make this the night before a party? Or will that ruin veggies ? That should be totally fine! What is the calorie count on this recipe? No idea- but you can input all of the ingredients into an online recipe calculator to figure it out, if you’d like. I usually use the Spark People Recipe Calculator. Great recipe!! Tried it with asparagus and it was equally as delicious!! This was delicious! I’m in love with roasted vegetables. I saw this recipe on Pinterest… was A-mazing! I was so inspired that I made it last night with lemon chicken and it rocked!!! 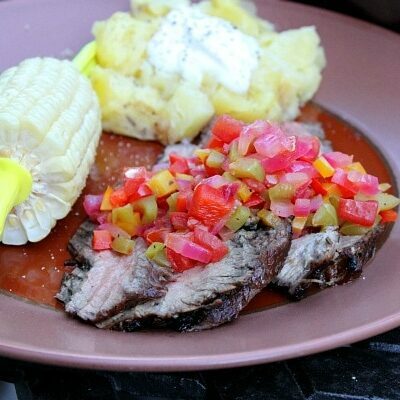 Seriously, thank you for sharing this recipe, it is fantastic.